Melodic songs about surviving the extraordinary under ordinary circumstances. Power Pop/Americana/Rock/Singer Songwriter. 12. The Wait Was Worth It? CD/DVD in one package! This recording was created over a span of fifteen years. That's not a long time in terms of say, human rights or historically monumental events, but in rock and roll...that's a lifetime. Here now is the culmination of that lifetime in music, which also happens to be Howell's first full-length album release. Featuring some of Chicago's greatest musicians/side men/ national stars (Mike Zelenko/Material Issue, Steve Gillis/Filter, Tony Kidonakis/horns in The Redwalls) as well as the midwest's most tragically unsung musical heroes (Casey McDonough/Lonni Lane/Mike Sharp). Power Pop becomes Americana becomes psychedelia becomes its own scary beast from tracks 1 to 12 playing out like most Greatest Hits compilations, only this compilation is Howell's debut. Also included with this album is a DVD independent feature "rockumentary" film called Beneath The Music: The Story of Greatest Hitch!, a supplemental companion disc which in itself took two and a half years to make. 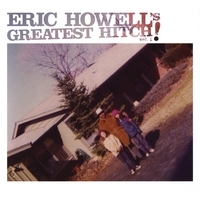 Told with humor, candor and a bit of pathos featuring interviews from Chicago's top musicians who played on the album, as well as testimonials from respected TV and radio personalities, and of course, Howell himself weighs in. A "must have" for any independent music collector and a crash course in D.I.Y. releases for independent bands everywhere. DVD 'Special Features' includes two music videos of songs not officially on the album, with each menu screen featuring rough mixes or alternate takes from the album.